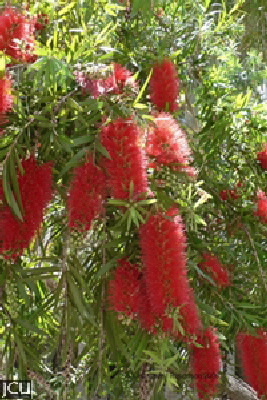 The genus Callistemon has recently been combined with the genus Melaleuca. It is endemic to Australia, where many species can be observed growing along watercourses. All species have the flowers crowded together in a spike of variable length, usually red or pink with numerous stamens, the fruits are woody capsules crowded together. The leaves are usually narrow and when held to the light oil dots can often be seen as clear areas. When crushed this oil produces a characteristic smell, strength depends on the number and size of the oil glands in the leaf. Birds and other animals are attracted to the nectar in the flowers. The most common species on campus is Melaleuca (Callistemon) viminalis, the weeping bottlebrush, also common along northern streams. There are many cultivars available.